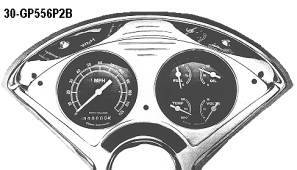 30-GP556P…5 GAUGE BOLT-IN PANEL Includes 2 GAUGES, ELECTRONIC SPEEDO. Quad cluster includes Water Temp & Oil Pressure also electric [senders included] as well as Volts & Fuel. [0-30 ohm so you do not have to replace stock gas tank sender]. Does not include dash cluster housing. 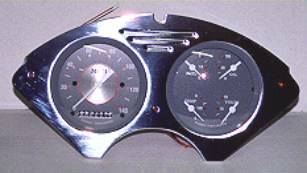 Includes 2- 3 3/8" Gauges (Speedo & Oil, Water, Volts, Gas), Senders (Speedo, Oil, Water), Polished Gauge Panel & 3 LED Lamps for Turn signal & High Beam. This is a really nice, dependable set-up with quality USA made Classic Instrumentsâ that have Curved Glass bezels. Many color choices available. Choose gauge & pointer color. Flat Glass, other color combinations possible as an option. 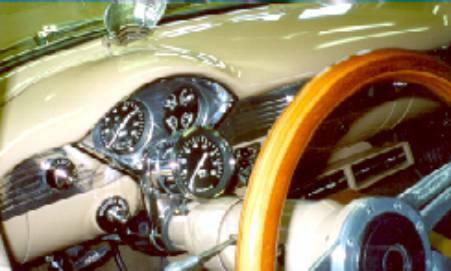 30-556TK… Tach Kit 55-6 Full size 3 3/8" cup mounted Classic Instruments tach with bolt on hidden mounting bracket. Bracket bolts to bottom speedo bezel screws. Choose gauge & pointer color. Picture shown with tilt column. Use this w/ Stick Bezel. Auto column shift cars need column mount shift indicator.